Removing Chewing Gum From Concrete - Pro Wash LLC. 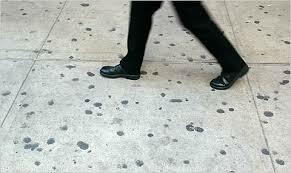 Ever wonder how all of those black chewing gum spots are removed from sidewalks? Removing chewing gum is a common occurrence at many commercial properties. Go the the entrance of any gas station, grocery store or market and you will most likely see the remnants of chewing gum stuck to the concrete. Besides being unsightly, it also invites others to follow suite and discard their gum on the sidewalk as well. Due to the chemical makeup of most chewing gum, and the acidity if the saliva its covered in, chewing gum should be removed as soon as possible. 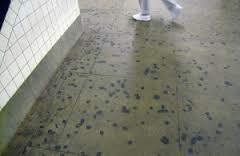 There is a much better chance of concrete developing a stain when gum has been on the surface for an extended period of time and in extreme cases gum can even etch concrete. How Do You Remove Chewing Gum From Concrete? As professional concrete cleaning contractors, we encounter chewing gum on a daily basis. We would like to share some tips when it comes to gum removal that should be taken into consideration before attempting to remove it. All concrete is not created equally! Age, porosity, and density all affect how the concrete will react to high pressure/hot water. If too much pressure is used, the concrete will be damaged by etching. 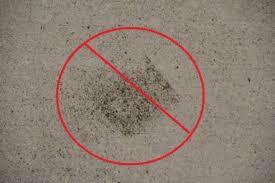 Etched concrete is usually not repairable so be extremely careful when dialing in your nozzle and distance settings. Cold water pressure washers are generally not recommended for chewing gum removal. Click here to learn more about the benefits of hot water pressure washing. There are other methods for chewing gum removal that work safely, however, the proper hot water pressure washer setup is by far the most efficient and reliable method. See the following links for more information on Steam powered gum removers and aerosol gum removers. What steps are involved in removing chewing gum? USE HOT WATER While hot water pressure washers are the go to tool for gum removal, its not the water pressure but rather the heat that melts the gum away. Using a cold water pressure washer can etch the concrete before removing the gum. PROPER TECHNIQUE The most effective approach for removing chewing gum is to use a gentle massaging motion with the water spray. Not too close though, remember the heat does most of the work. SELECTING A NOZZLE A higher flow nozzle should be used for chewing gum removal. If your pressure washer is rated at 5 gallons per minute at 4000 psi, something in range of a #10 nozzle with a 25 degree fan pattern would be an ideal place to start. This nozzle would reduce the pressure to around 700 PSI at the nozzle. Unfortunately, all concrete is different and experimentation is necessary to find the correct pressure, nozzle and distance settings. Use this nozzle chart to find the correct nozzle for the desired pressure. For most homeowners and businesses, chewing gum removal would be best left to a professional pressure washing contractor. Having the right equipment and training ensures that concrete surfaces can stay free of gum without permanent damage to the surface. Pro Wash, LLC has been keeping the Nashville and Middle TN areas clean for many years. We would be happy to advise you on the cleaning processes for you business or residence. With several hot water pressure washing rigs in service daily, we have the expertise and equipment needed to provide stunning results while provided top tier customer service. Check out this POV video that shows how easy chewing gum is removed when a hot water pressure washer is set up properly and the correct nozzle is in use.